Well, that’s that then: Christmas done and dusted for another year. We’re now in the no-man’s land between Christmas and New Year, a lost time of relaxation and not quite knowing what to do with yourself (unless you happen to be back at work…). It’s also a great time to have a good decluttering session to put you back on the track for the New Year (because no home ever feels quite right until a few weeks after the festive season). It’ll give you a moment’s peace from the festive chaos too. Here are some top post-Christmas decluttering tips. Did you get a new phone, console or tablet for Christmas? Lucky you! After unwrapping your brand new gizmo, you probably stashed your old one in a drawer somewhere ‘just in case’. Bad idea: smartphones, games consoles and tablets stored away in drawers or the attic are a major cause of clutter and lose value over time too. Selling your unwanted electronics now means less hassle in the future, and you’ll get the best possible price for them too. We’re big fans of Cynthia Ewe’s ‘get one, toss two’ tip when it comes to clearing out CDs, DVDs and games: for every new item you receive, sell two that you don’t use anymore. Not only will you have space for your new stuff, but you’ll gradually reduce the amount of stuff you own overall too, making future decluttering sessions a lot easier. Did you find getting your home ready for Christmas stressful this year? Did anything get in the way of you setting the table for dinner, or finding enough space to fit your whole family in the living room? Then make your life easier next year and get rid of the stuff that caused you grief this year. After Christmas, most people’s houses are filled with boxes: from toys, from alcohol, from food and so on. 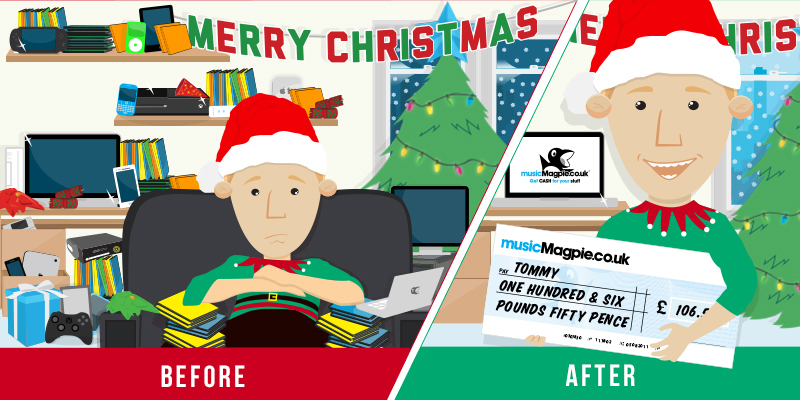 Fortunately, these boxes have a use: you can use them to send your clutter to musicMagpie! The longer you put off a decluttering session, the harder that decluttering session will be. The best approach is to tackle your clutter a little bit at a time and often. According to research by the University of Hertfordshire, New Year’s resolutions are almost impossible to keep. They monitored 700 people who made resolutions in 2009, and 78% of people failed. The reason for such a high failure rate, according to the study, is that people focused on the future and relied on willpower alone. Just saying you’ll tidy more often and visualising a clean home isn’t enough (although it’ll help). To give yourself the best chance of success, split your resolution into smaller steps and reward yourself every time you achieve a milestone. You could resolve to declutter once a month, or just to clear up a certain part of your life for a short period of time. Over time, all of these small steps will add up to one big resolution! So, if you’re sitting there twiddling your thumbs, spend a little time decluttering instead; you’ll appreciate the extra space and money. Click here to get started, or download our FREE Android or iOS app.